Weekly payment amount may vary based on approval limit and tax. Upholstery Bed including 4 slats. Boxspring required. 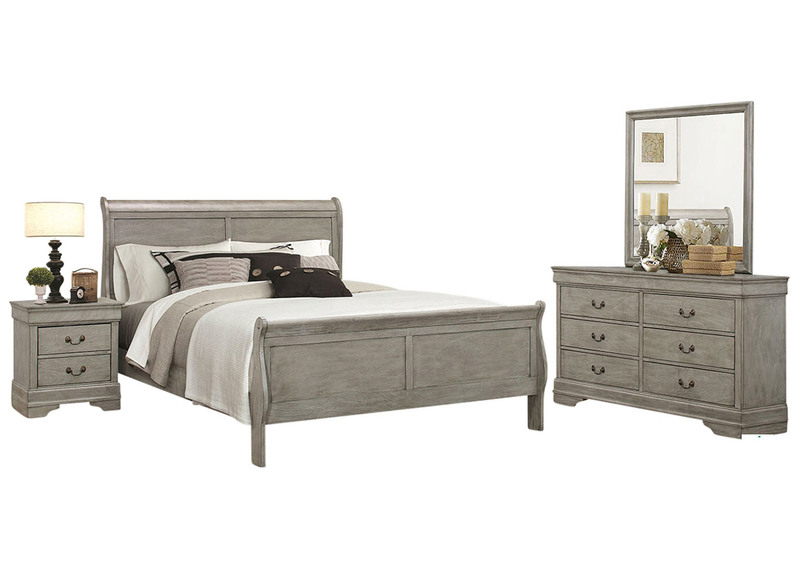 Decorate your master bedroom with the refinement of the Louis Philip collection. Traditionally styled with a formal look and feel, it features a number of bedroom storage pieces as well as a beautiful sleigh bed to outfit your bedroom space. Offering both style and storage, each piece is finished in a rich black or crisp white and select pieces have drawers for storage. A classic collection that will be admired by many, Louis Philip is an elegant addition to any home. 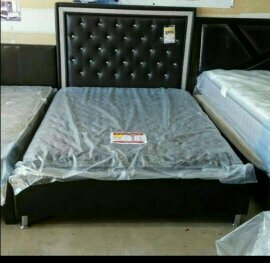 4pc king bed set . queen 4 pc bed set .queen bed,dreesser,night stand,mirror Modern style and irresistible price point showcase the Bravia collection of bedroom furnishings, the perfect choice for the budget conscious consumer. The Bravia collection, shown here in warm walnut brown tones, includes king or queen size bed , chest, dresser, mirror and/or nightstand (all items sold separately) and its contemporary design makes it an easy and stress-free way to update many room environments. Design elements include silver-toned drawer hardware and center glide/positive stop drawer construction along with interesting geometric design incorporated into the padded headboard. The Bravia collection will satisfy your eye for style without sacrificing your pocketbook. The Bravia bedroom set - stylish and affordable. queen bed dimond platform bed $199 kimg $299 Best Master Furniture Upholstered Platform Bed, Faux Leather, Multiple Colors & Sizes: No foundation needed Has slats: 13 pieces Leather-like exterior Bright crystals and rhinestones Mattresses sold separately. See our assortment of mattresses The Best Master Furniture headboard is made with leather like exterior well padded with button rhinestones for added sparkle and shine. The headboard is outlined with crystal silver like pattern. It is available in black or Assembled Product Dimensions (L x W x H)	86.00 x 63.00 x 44.00 Inches white color. METIS INNERSPRING PLUSH TOP MATTRESS QUEEN FEATURES: Foam Encasement Layer (FEL). 5/8” Cool Foam layer offers a uniquely cool sleeping surface that amplifies the dispersion of body heat and dissipation of excessive humidity, creating a breathable and comfortable sleeping surface. High tensile steel wire 14-Gauge Innerspring Unit. Knitted fabric. Quilted panel with 1 5/8" quality foam. Meets the requirements of 16 CFR Part 1633. WARRANTY: 12 YEARS. JUPITER INNERSPRING MATTRESS QUEEN FEATURES: High tensile steel wire 14-Gauge Innerspring Unit. Knitted fabric. Quilted panel with 1.4lb quality foam. Meets the requirements of 16 CFR Part 1633. WARRANTY: 10 YEARS. MIRANDA INNERSPRING MATTRESS FEATURES: High tensile steel wire 14-Gauge Innerspring Unit. Tricot fabric. Quilted panel with 1.4lb quality foam. 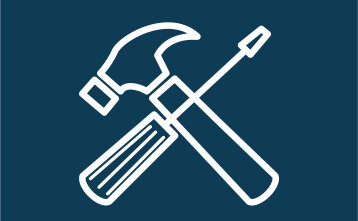 Meets the requirements of 16 CFR Part 1633. Special edition: dual-sided mattress with high quality quilted panels and 11” height.